Regular readers know that, these days, art comes to the viewers as much as the other way around. But is it art if it's really an advertisement for an insurance company? 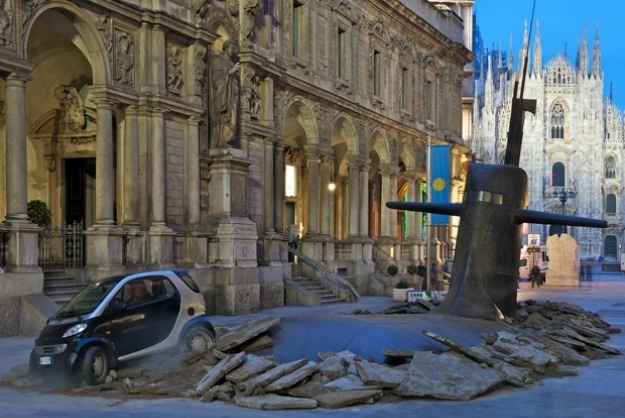 The sub was docked here as part of a publicity stunt for Europ Assistance Italia. The mistake that M&C Saatchi, the company's advertising agency, made was telling the public right away what the installation is all about. Art and commerce can and does mix, but separating the two with a little bit of time goes a long way to building curiosity, water-cooler conversations and authentic artistic merits. What do you think? Let us know.